Just type in x^2-y^2 into Google’s search box and you get the saddle figure – and you can move it around as well! With these types of ready- to -go aids for graphing, anyone can incorporate serious graphics into teaching and learning math. 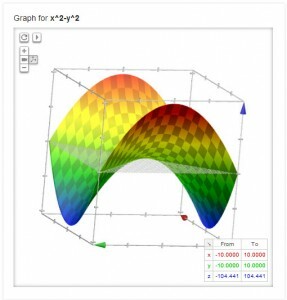 Click on the image to see a “live” version of the surface \(z=x^2-y^2\).